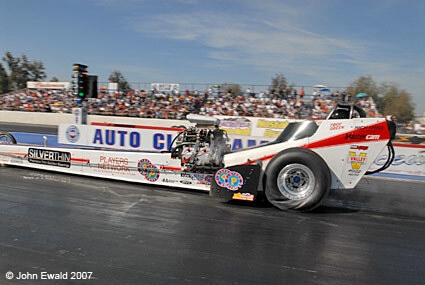 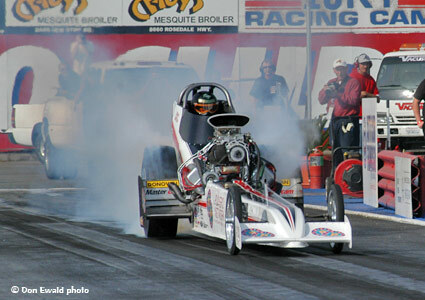 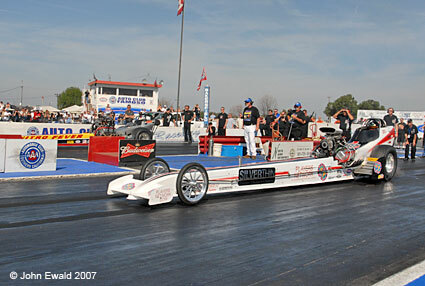 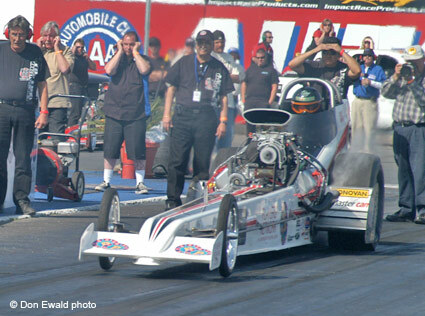 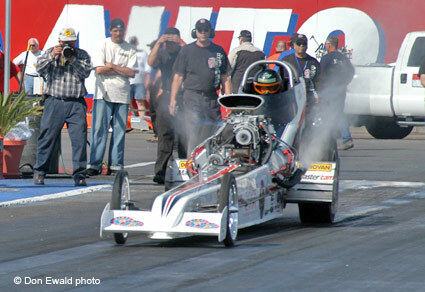 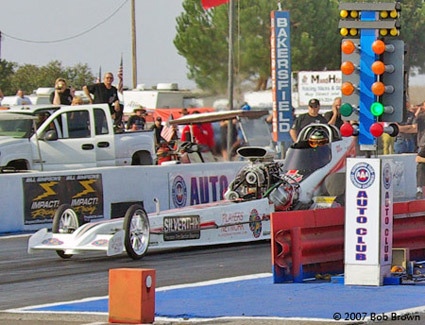 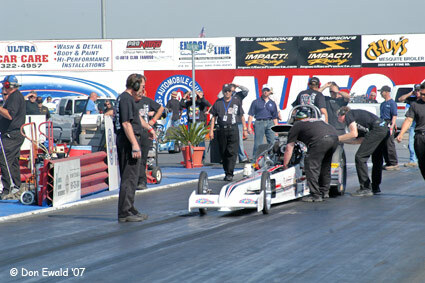 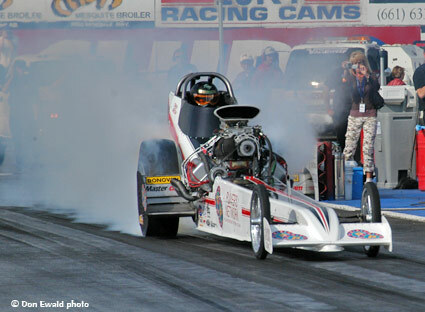 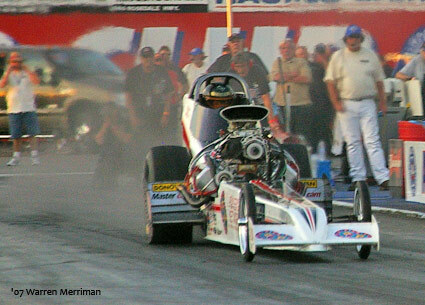 Bakersfield, CA - March 09-11, 2007: The 49th edition of the March Meet was everything you could expect from the premier drag race of the nostalgia season. 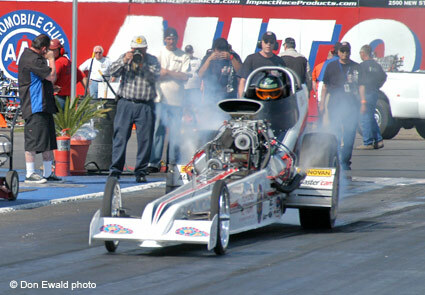 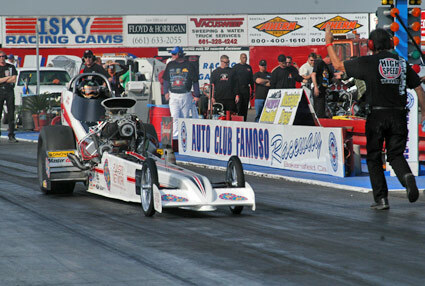 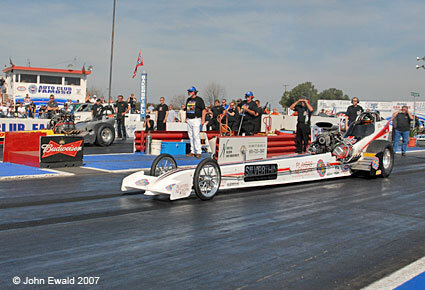 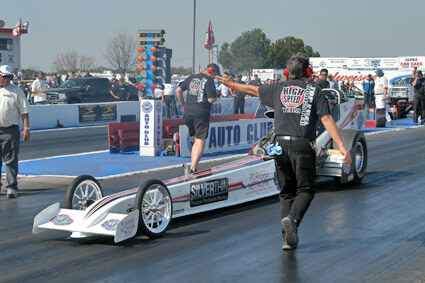 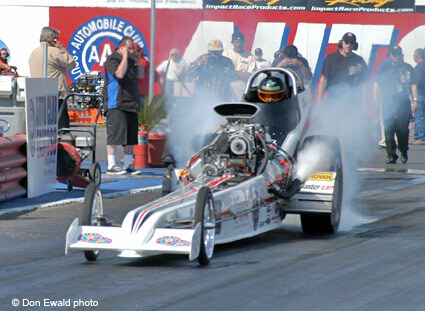 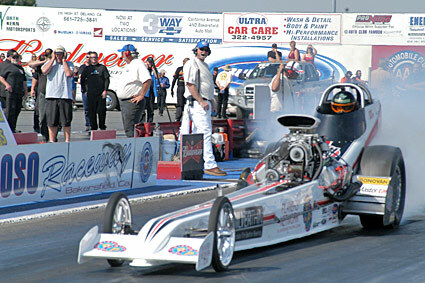 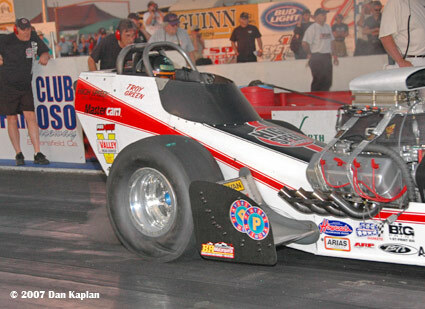 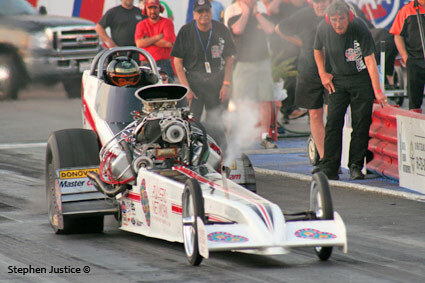 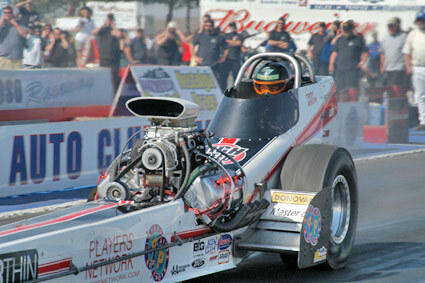 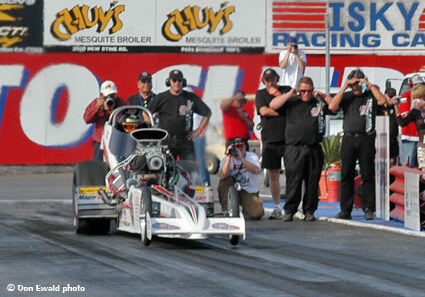 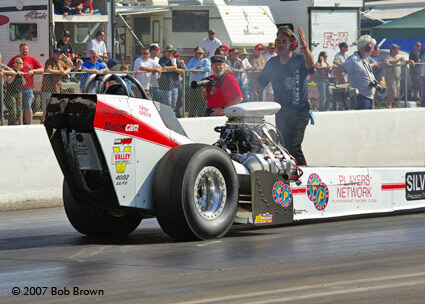 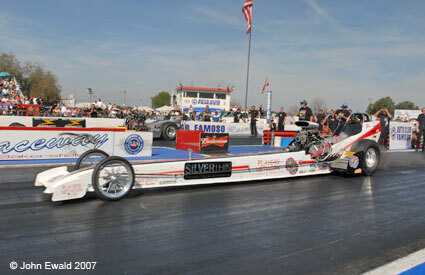 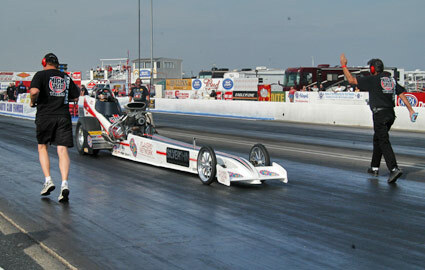 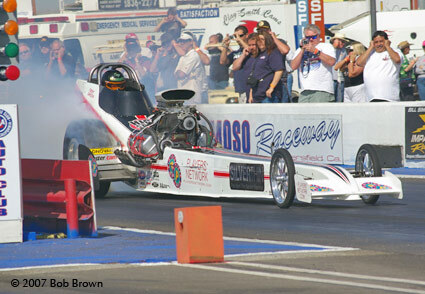 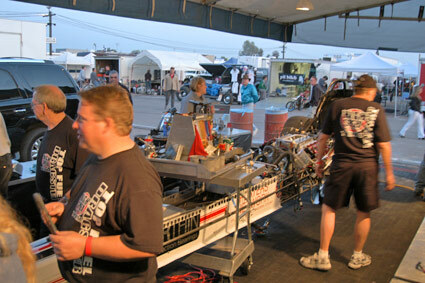 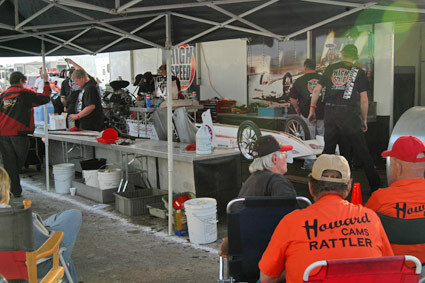 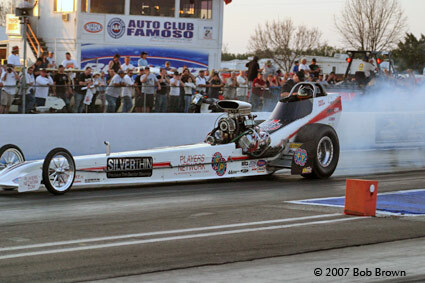 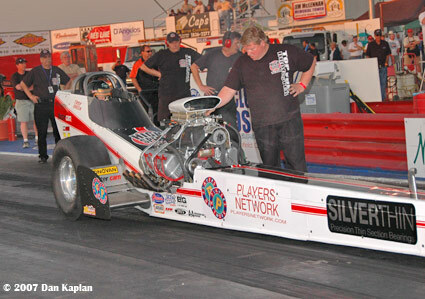 John and Blake Bowser - with a lot of help from the Famoso Raceway staff - put on a drag race for the ages. 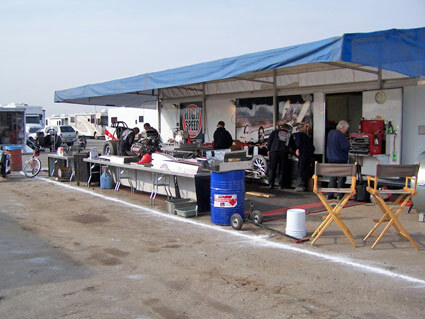 From the full pits on Thursday to the Winners Circle shots on Sunday this was an event blessed with Chamber of Commerce weather, an accommodating facility, incredible racing surface, friendly staff, full bore fans and upbeat attitudes throughout. 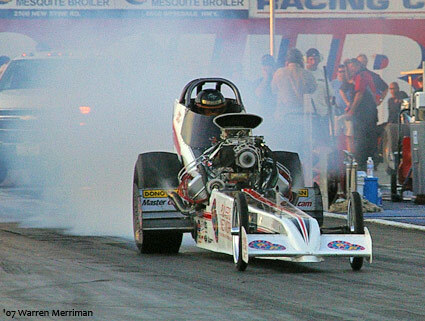 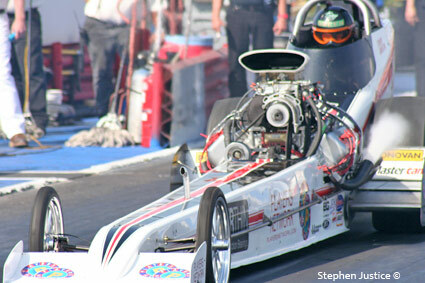 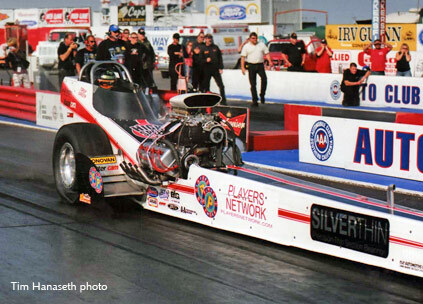 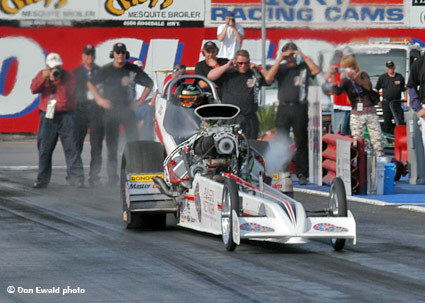 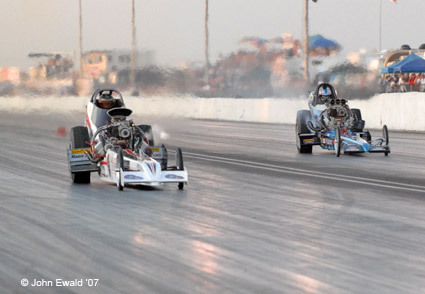 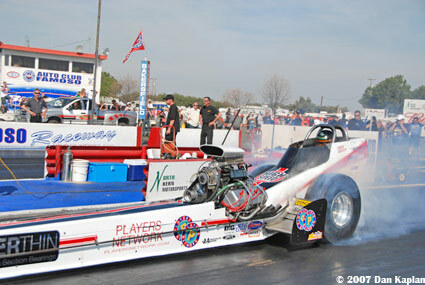 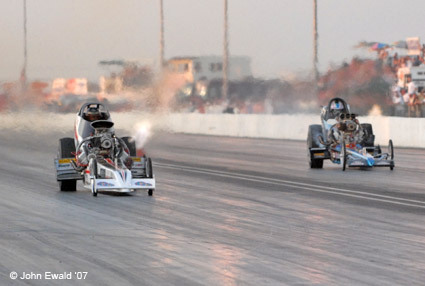 The 35,000+ fans that packed the facility over the three-day event were treated to over 500 race cars including 20 of the countries best Top Fuel dragsters including Troy Green and the Highspeed Motorsports team. 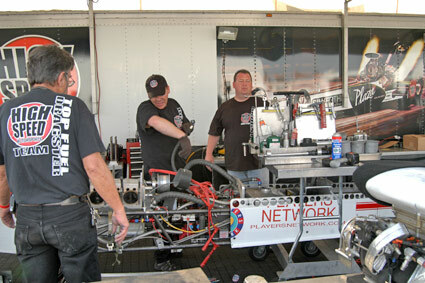 Unfortunately the guys got behind the 8-ball early on when they lost the first two qualifying runs do to mechanical problems. 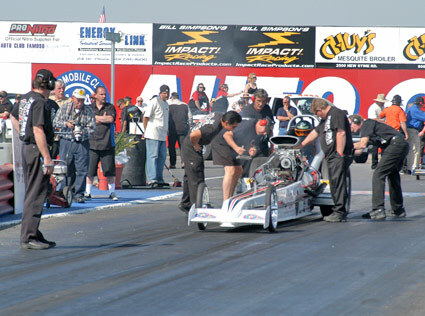 Green did get into the show on the last attempt but the team lacked the data to tune the engine to its potential and lost a very close race in round one. 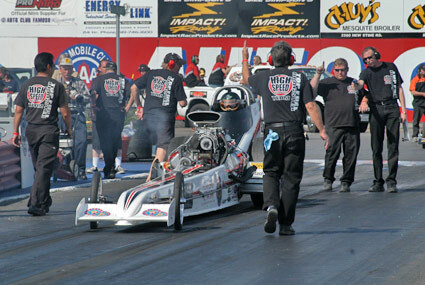 Under sunny skies and ideal track conditions the first session of Top Fuel qualifying went off at 2:30 p.m. Friday afternoon. 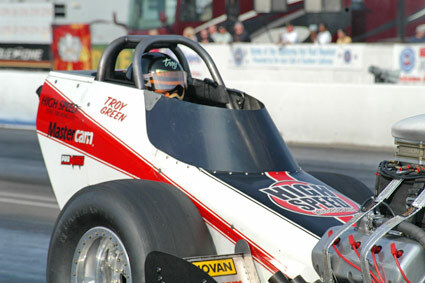 Ironically Troy Green was paired with Jason Richey who he would end up meeting for the first round of eliminations on Sunday. 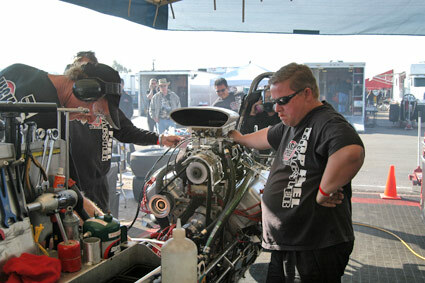 As usual, Walt Sevens backs Green up while Roger McMartin observes the engine functions. 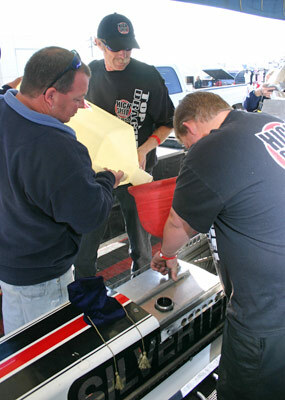 Crew Chief Brett Johansen brings Green up to the staging beams. 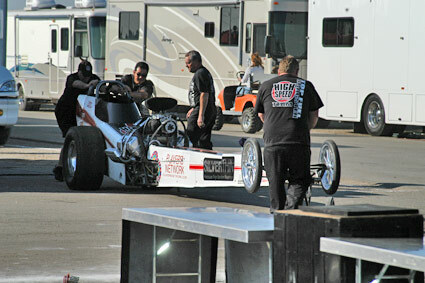 The car left good and appeared to be on a decent run. 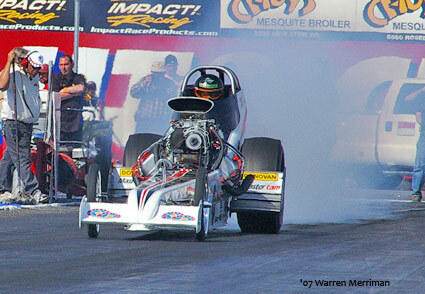 Then before half track the car inexplicably nosed over and Green wisely shut it off coasting to a 9.204 at 98.41. 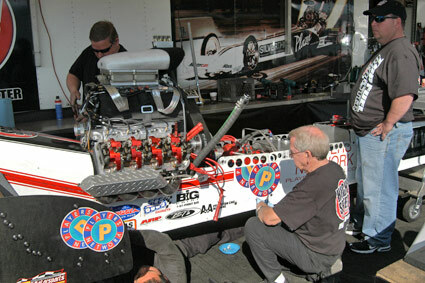 After getting back to the pits the crew went to work full bore to find out why the car literally stopped running under power. 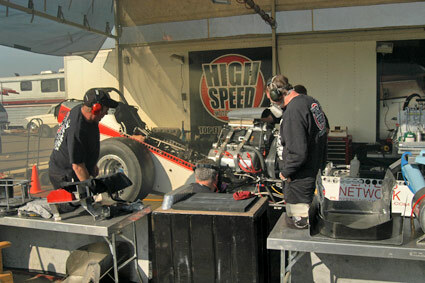 Debris was found in the supercharger raising more concern. 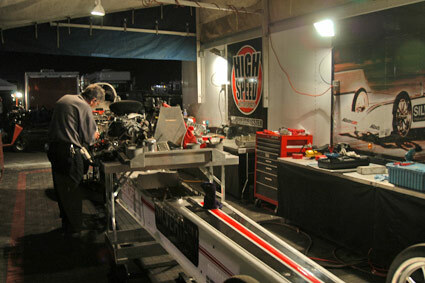 They worked into the night checking and testing everything that could have caused the problem. 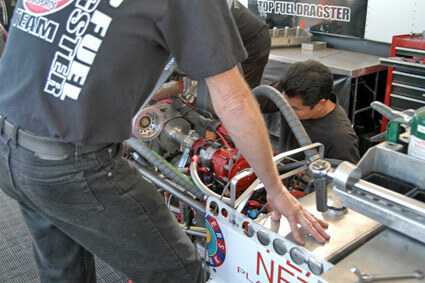 The magneto was checked and replaced, the fuel pump was flowed and the blower replaced. 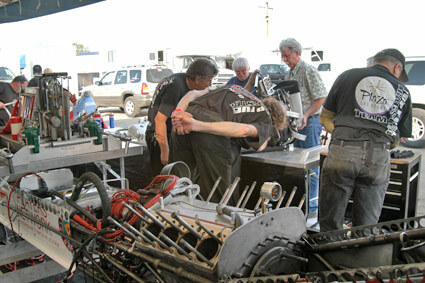 By the time the car was back together they were confident (or at least hopeful) that the car would do what it was suppose to the next day. 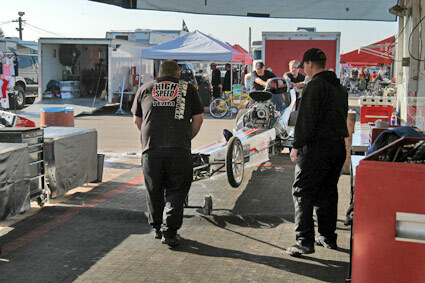 The car comes out of the trailer at 8:00 a.m. to be readied for the second session scheduled for 11:00 a.m. 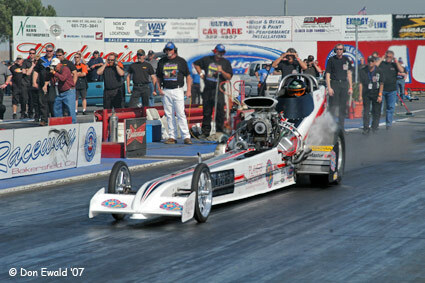 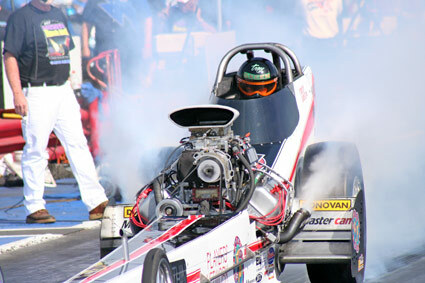 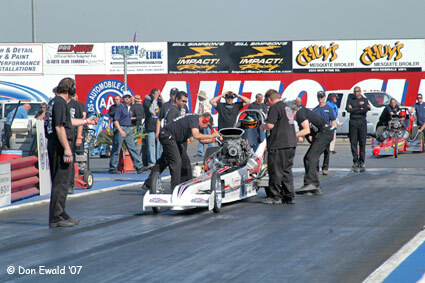 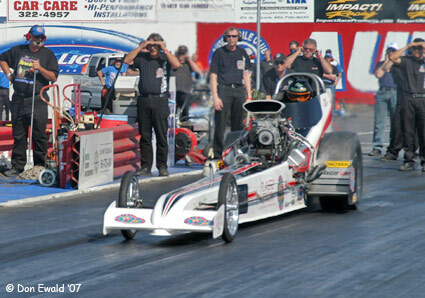 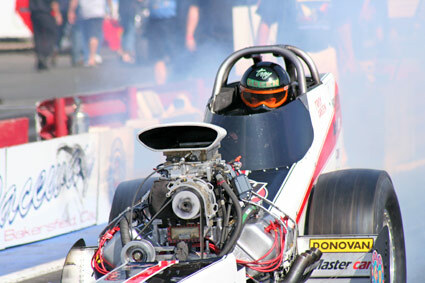 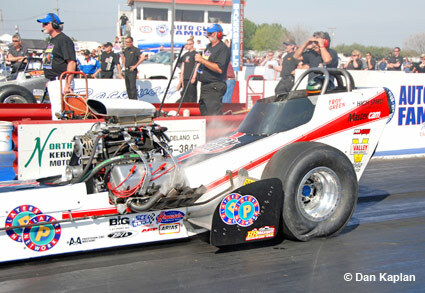 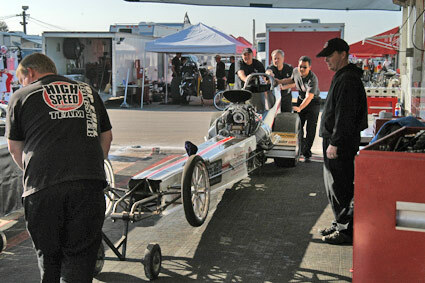 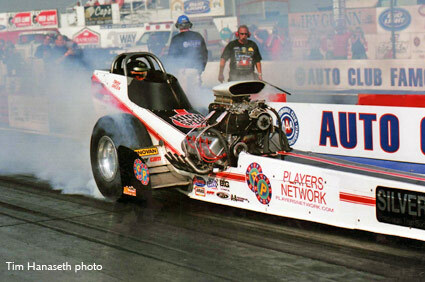 The car is filled with nitro prior go heading for the staging lanes. 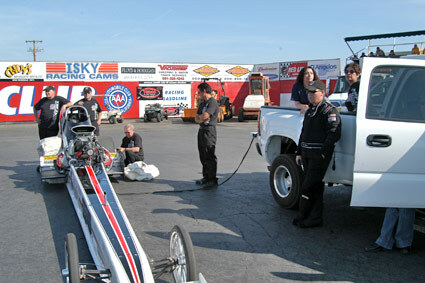 As usual Johansen checked out the track and its temperature before the session started. 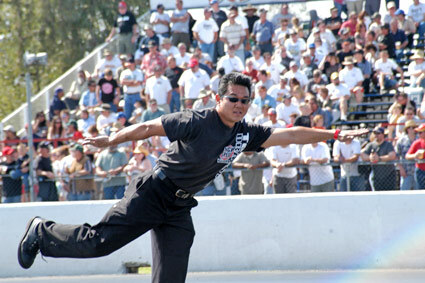 On the other hand, Brian Kono practiced for his role in Swan Lake. 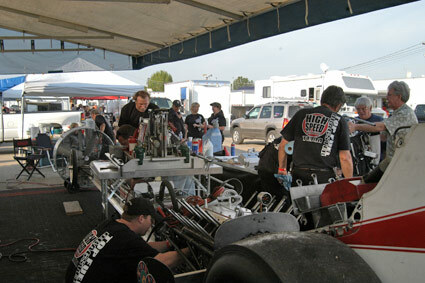 1:41 p.m. 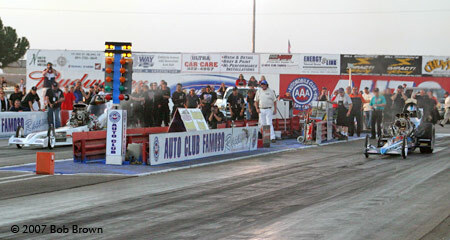 Weather conditions: air temperature 68 degrees, relative humidity 33 percent, barometer 30.14 inches, track temperature 84 degrees. 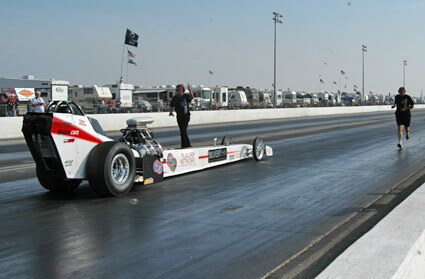 Very nice racing conditions. 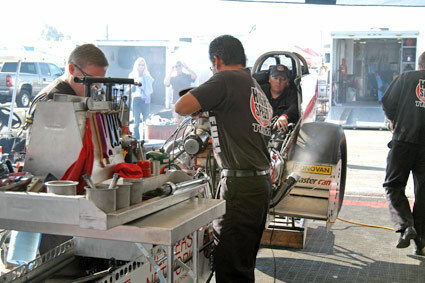 For his second shot at the superb Famoso track. 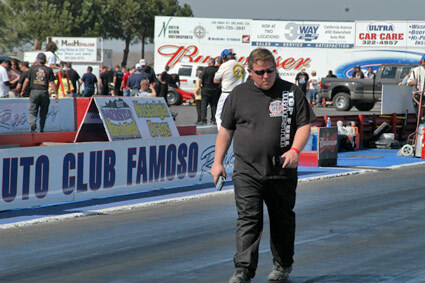 In the other lane was Pete Kaiser. 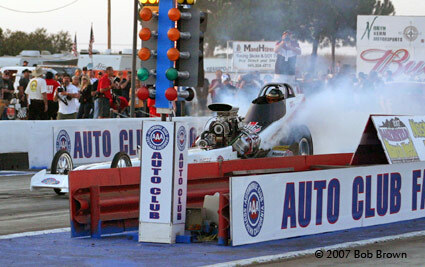 The burnout was an omen for the run - the engine didn't sound right and Green cut the burnout short. 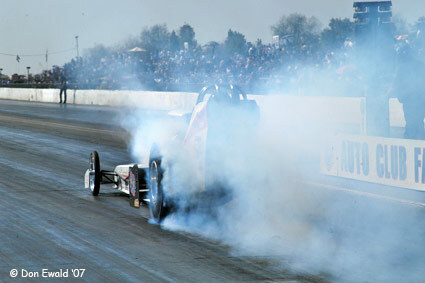 The car was soft at the leave - only running on 7 cylinders. 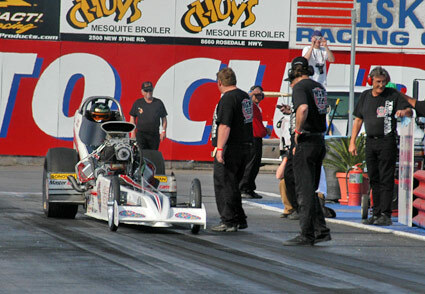 Once again the engine quit running and Green had to coast through with a 8.592 at 127.69. 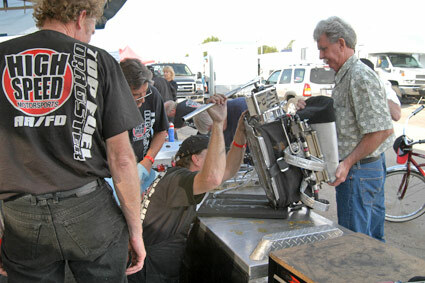 This left the car on the outside looking in with just one more chance to qualify. 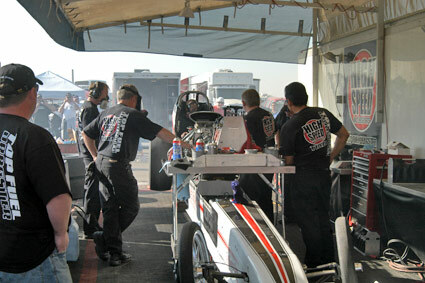 Back at the pits the crew focused on anything that could cause the engine to seemingly run out of fuel early in a run. 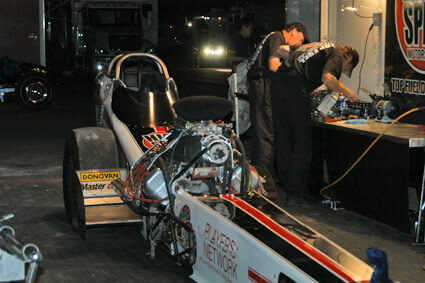 Process of elimination pointed a finger at the fuel shut off valve. 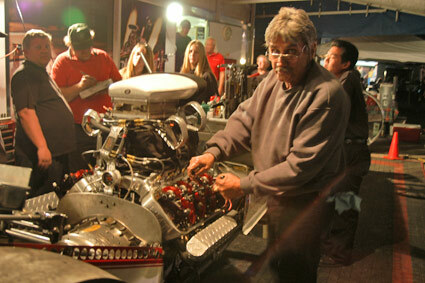 They were pretty sure that it was vibrating shut thus cloaking off the fuel delivery to the engine. 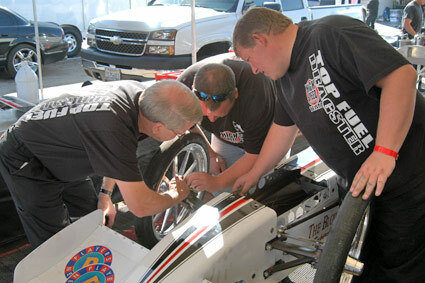 The valve was fixed and the car was prepped for session three. 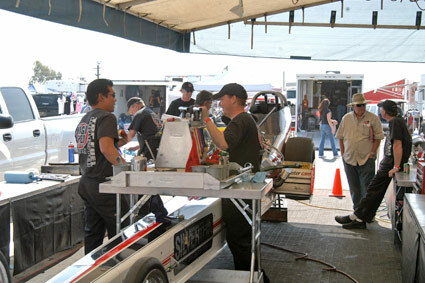 Running 2 hours behind schedule, the final session got underway at 5:46 PM. 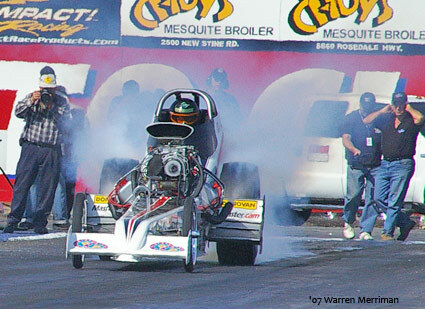 With the sun falling in the West and the track cooling off Green was paired with Brendan Murry for this do or die effort. 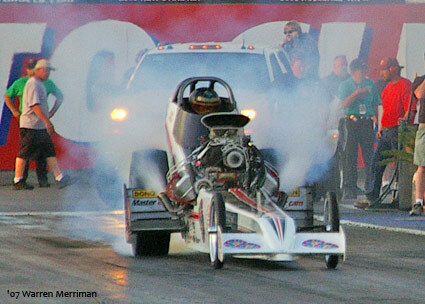 Johansen pulls the idle plug just before Green puts on the first light. 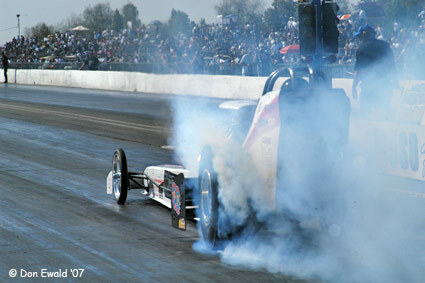 This time the car sounded better and left harder. 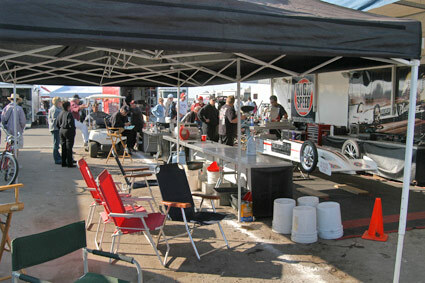 Fingers crossed. 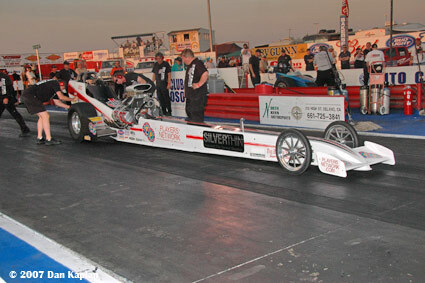 Still under power at the 900 foot mark Green knew he would qualify. 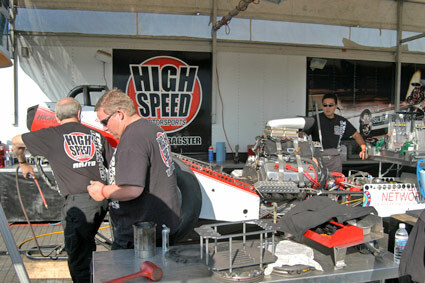 The only question was where. 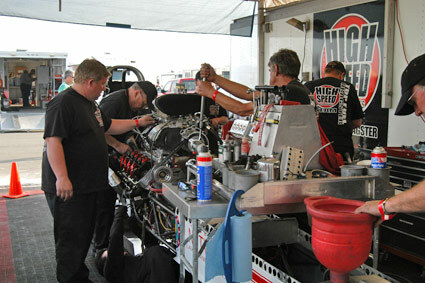 Sacrificing some pistons to card a nice 5.927 at 244.10 which would land him in the # 8 spot for Sunday's eliminations. 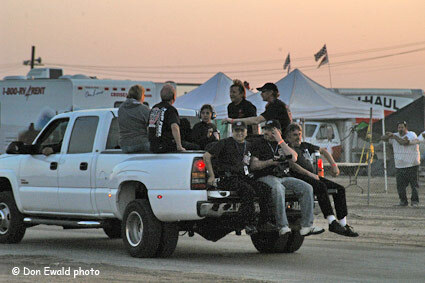 Needless to say the entire crew was elated. 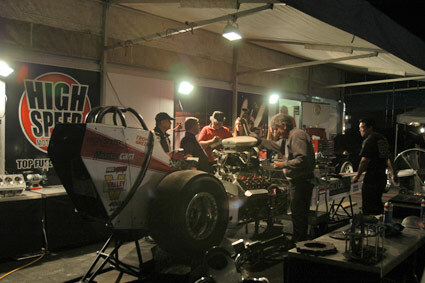 After qualifying the crew worked into the night to overhaul the engine, change the clutch and get the car ready for Sunday. 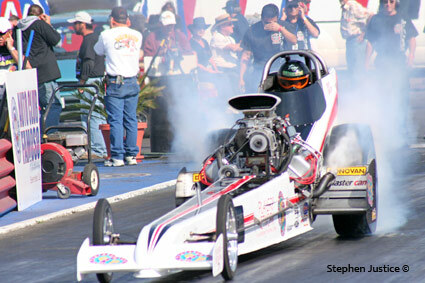 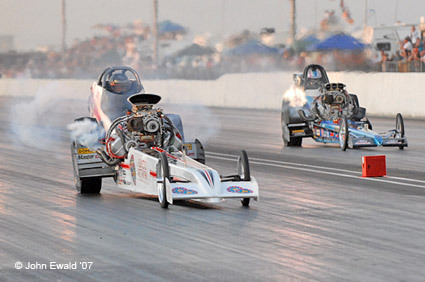 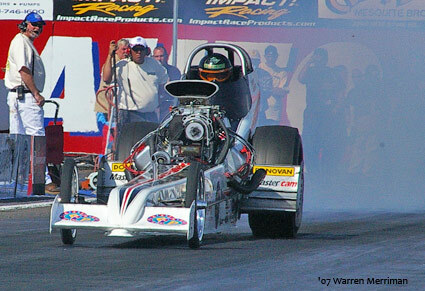 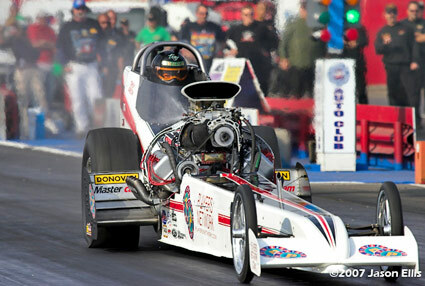 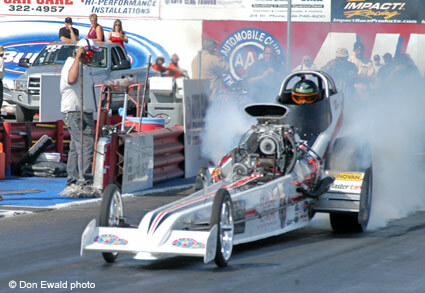 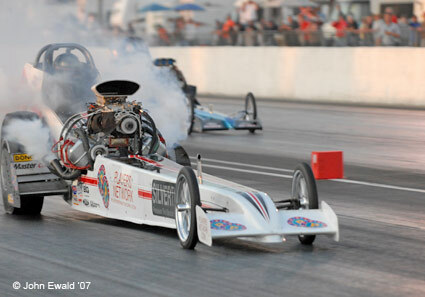 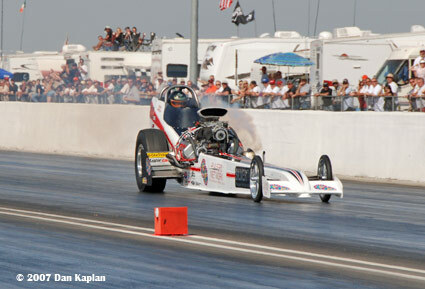 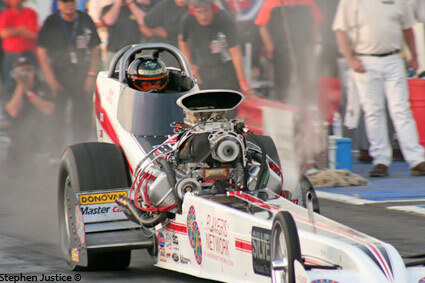 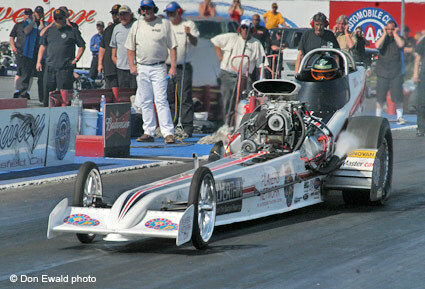 This is the part of drag racing that most fans never see and what makes it not quite as fun as it looks. 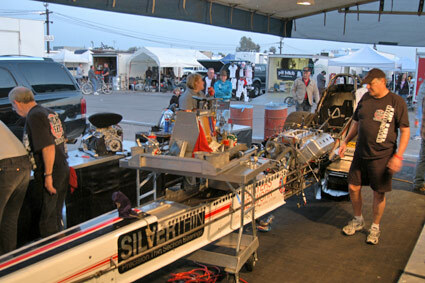 On any give day at a race, the last person to usually leave is Tom Shelar who's life away from his business, MasterCam, seems consumed doing cylinder head repair and maintenance. 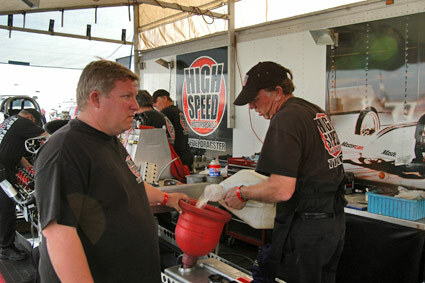 Shelar, who machines the teams heads from billet aluminum, makes sure the car has a fresh set every run. 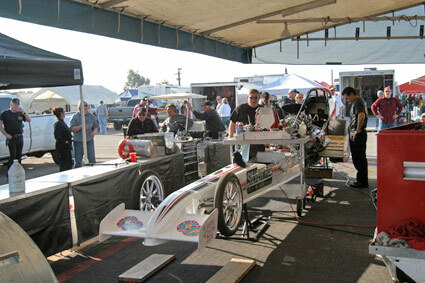 Sunday morning is spent making sure the car is 100%. 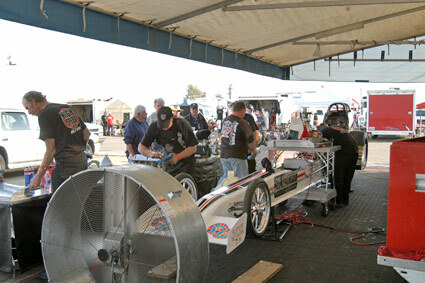 About an hour before round one the engine is warmed up and checked for any leaks or potential problems. 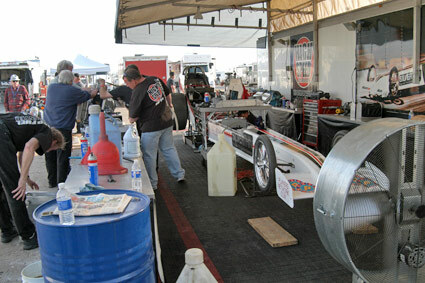 The first step is to use methanol to get some heat in the cylinders before switching over to 92% nitromethane. 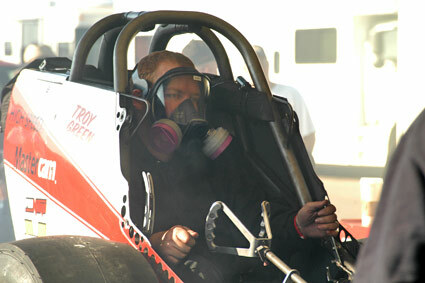 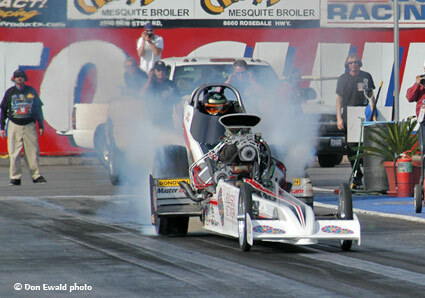 At the change over most of the crew puts on gas masks and the air fills with the yellow "nitro haze". 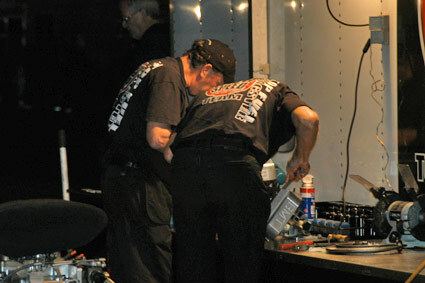 When all is good, the fuel shut off is pulled and Brett Johansen squirts methanol into the injector as the stops running. 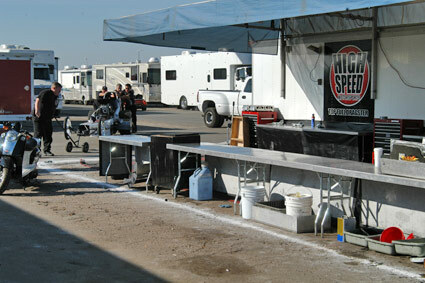 10:59 a.m. 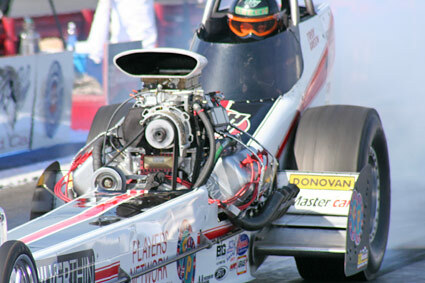 Weather conditions: air temperature 67 degrees, relative humidity 38 percent, barometer 30.18 inches, track temperature 78 degrees. 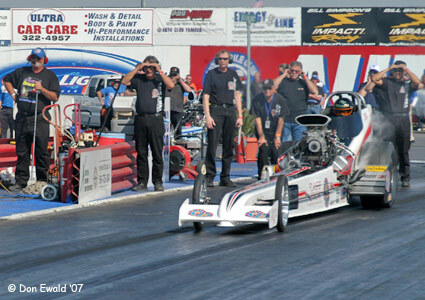 It's time to race. 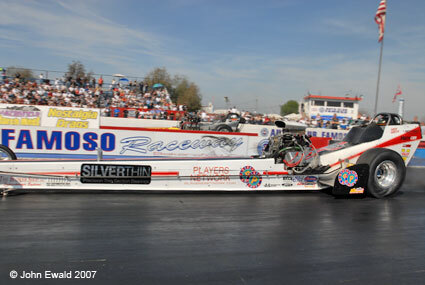 By virtue of being the # 8 qualifier Green would race the # 9 car, Jason Richey, and were the first pair to run Sunday morning. 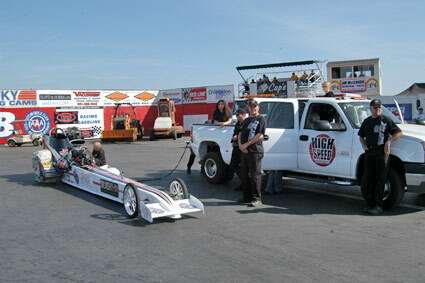 Both cars were staged behind the water box during the pre race ceremonies so the could start at the end of our National Anthem. 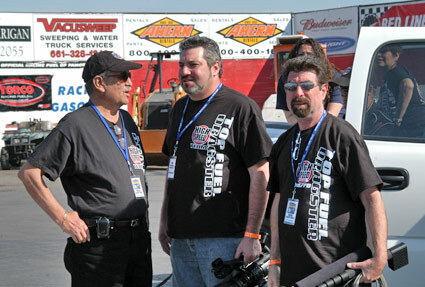 High Speed Motorsports CEO Dale Singh with Players Network Chairman Mark Bradley and Michael Berk who is President of Programming for Players Network. 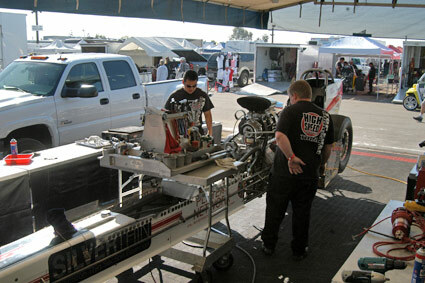 Bradley and Berk were at the race all weekend gathering material for a new website they are going to launch in conjunction with High Speed Motorsports that revolves around nostalgia drag racing. 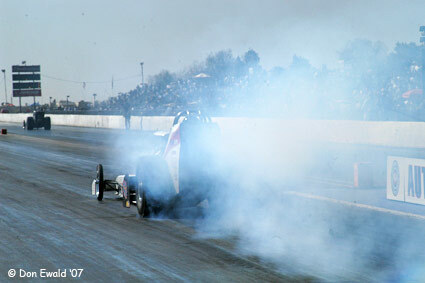 Richey, who does extremely long burnouts went first, Green followed. 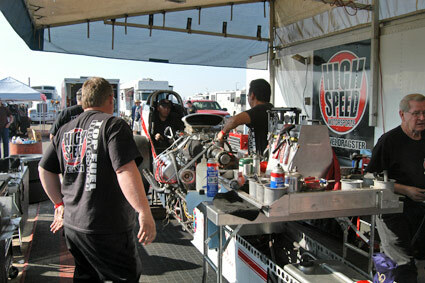 At the flick of the starter switch Green did his job strapping a 0.058 to 0.105 holeshot on Richey. 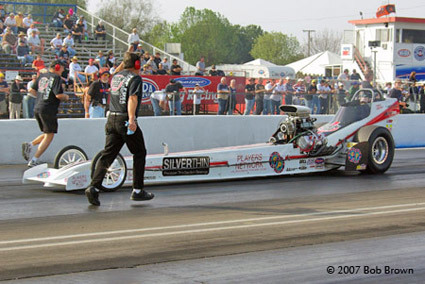 Early on Green had a palpable lead and Richey was left to play catch-up for the next 1317 feet but right before the ET light Richey literally nosed ahead for the closest win of the event... his 5.864 at 247.25 denied Green with a 5.917 at 245.03. 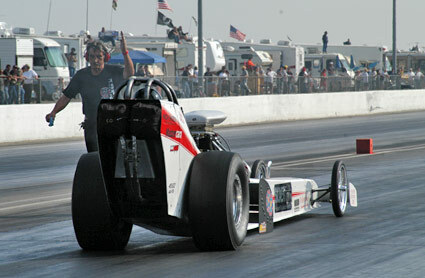 His margin of victory was a mere 0.0061 seconds (approximately 2 feet). 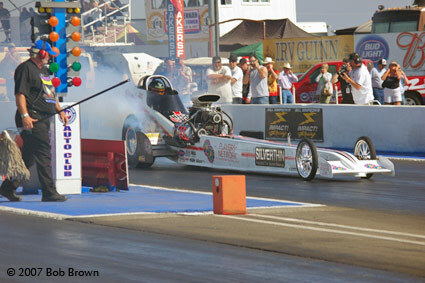 This was a text book drag race and unfortunately the High Speed car came up a wheel short.